Welcome to an Occupied World! 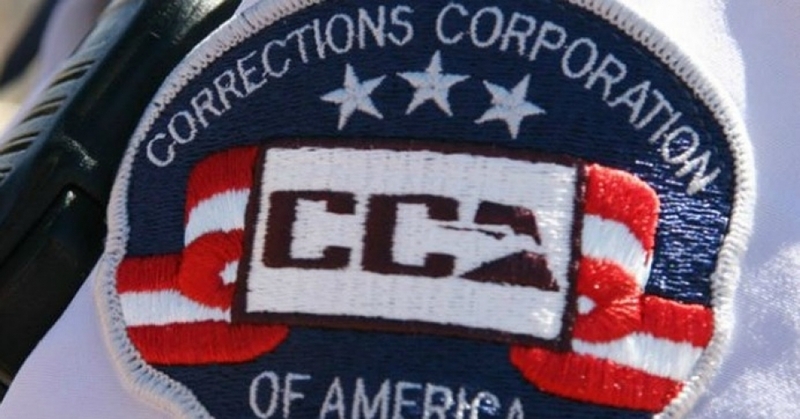 After years of documented human rights abuses by the private prison industry, the U.S. Department of Justice (DOJ) is finally ending its use of privately-run, for-profit prisons, the Washington Post reports. This entry was posted in Civil Rights, Corruption, Economics, Government, Human Rights, Privatization, Racism, Social Justice and tagged ACLU, Atrocities, Capitalism, CCA, Center for Constitutional Rights, Civil Rights, Corrections Corporations of America, Corruption, Economics, Equality, Human rights, Income Inequality, prison, prison-industrial complex, racial bias, racial profiling, Racism, Security, social justice on August 19, 2016 by ew. 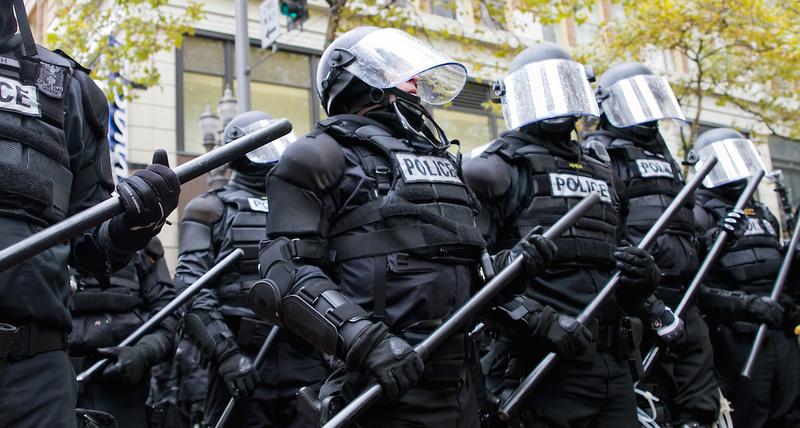 United States — Lurched back and forth in the ever-quickening spiral of an American empire circling the drain, we — as a people — have chosen battle lines on nearly every issue from politics to foreign policy, domestic surveillance to policing. This entry was posted in Civil Rights, Corruption, Demonstrations & Protests, Government, Human Rights, Media Issues, National Security vs Police State, Racism and tagged BlackLivesMatter, Civil Rights, Corruption, Equality, Human rights, Media Issues, police deaths, police militarization, Police State, Protests, racial bias, racial profiling, Racism, Security, social justice on July 24, 2016 by ew. 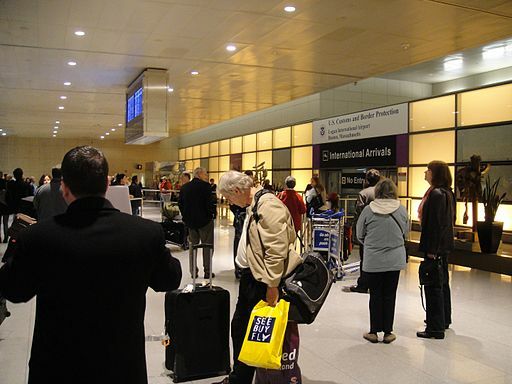 It appears even foreigners are scared of United States law enforcement. This entry was posted in Civil Rights, Demonstrations & Protests, Economics, Government, Human Rights, International Agreements, National Security vs Police State, Racism, Social Justice and tagged Alton Sterling, Atrocities, Bahamas, Civil Rights, Dallas, Economics, Equality, Human rights, International Agreements, Philando Castile, Police Brutality, police deaths, Protests, racial bias, racial profiling, Racism, Security, Tourism, Travel on July 11, 2016 by ew. This is a common, growing conversation in the United States. 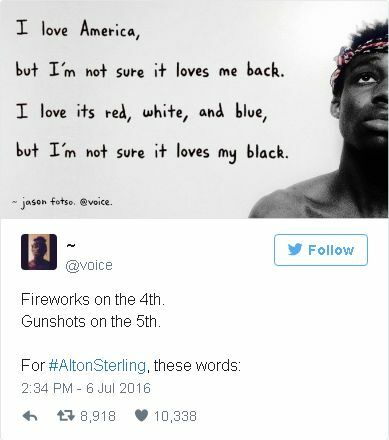 This entry was posted in Civil Rights, Corruption, Demonstrations & Protests, Human Rights, National Security vs Police State, Racism, Social Justice and tagged Alton Sterling, Atrocities, BlackLivesMatter, Civil Rights, Corruption, Equality, Human rights, Louisiana, open carry, Police Brutality, police deaths, Protests, racial bias, racial profiling, Racism, Security, social justice on July 10, 2016 by ew. 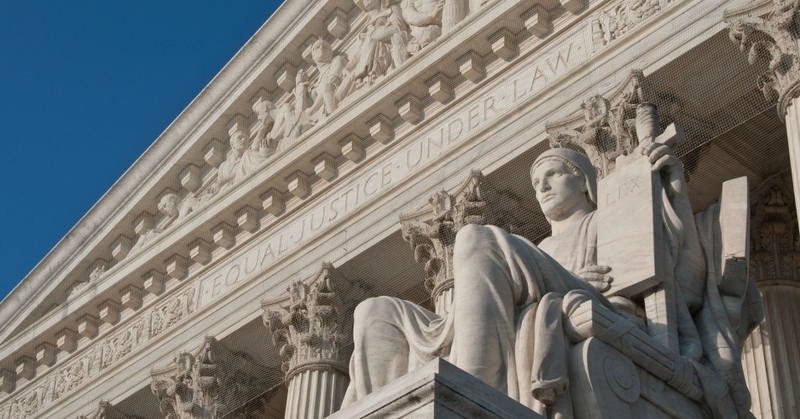 The U.S. Supreme Court on Monday ruled that evidence recovered during illegal stops may still be used in court, if police officers conducted their searches after learning that a defendant had an outstanding arrest warrant. This entry was posted in Civil Rights, Government, Human Rights, National Security vs Police State, Racism, Social Justice, Supreme Court and tagged Civil Rights, Fourth Amendment, Human rights, illegal search, racial profiling, Racism, Security, social justice, Supreme Court on June 21, 2016 by ew. 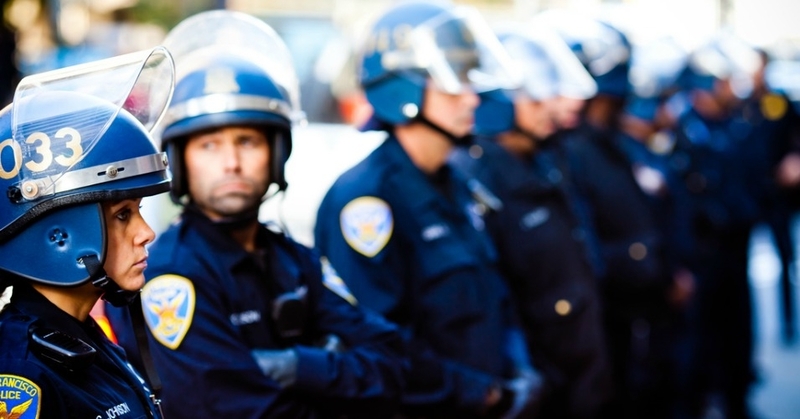 A striking new analysis published this weekend found that federal prosecutors failed to pursue civil rights complaints against police officers a full 96 percent of the time. This entry was posted in Civil Rights, Corruption, Government, Human Rights, Media Issues, National Security vs Police State, Racism, Social Justice and tagged Atrocities, Civil Rights, Corruption, Department of Justice, Equality, Human rights, Media Issues, Police Brutality, racial bias, racial profiling, Racism, social justice on March 15, 2016 by ew. 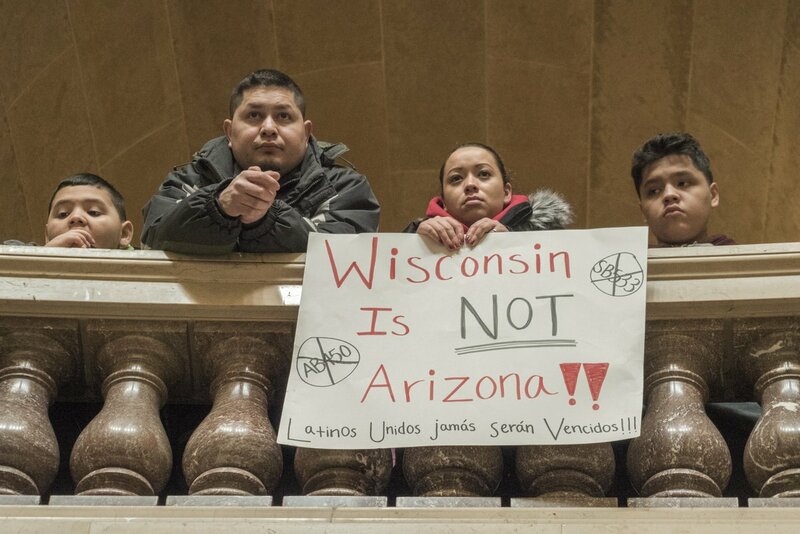 Workers, students, and activists walked off the job and out of their schools for a massive action in Wisconsin on Thursday, protesting two anti-immigration bills currently advancing through the state legislature. This entry was posted in Agriculture, Civil Rights, Corruption, Demonstrations & Protests, Economics, Elections, Government, Human Rights, Immigration, Peaceful resistance, Racism, Social Justice, Solidarity, Voting, Women's Issues, Workers' Issues and tagged AB450/SB369, Arizona, Civil Rights, Democracy, Economics, Elections, Equality, Human rights, immigration, Protests, racial profiling, Racism, Scott Walker, social justice, Solidarity, Voces de la Frontera, Wisconsin, Women's Issues, Worker's Rights, workers' issues on February 19, 2016 by ew. 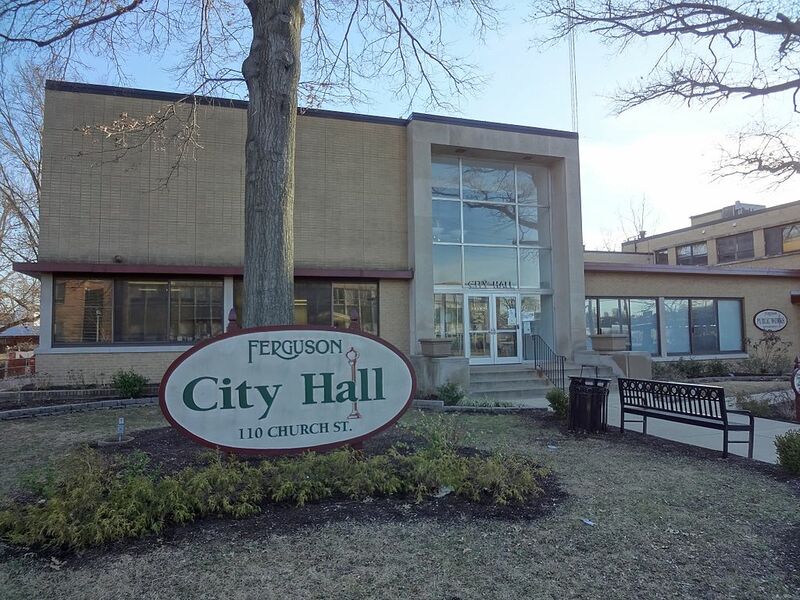 In response to Ferguson City Council requesting amendments to a consent decree, the Department of Justice (DOJ) announced Wednesday that it will “aggressively” prosecute a civil rights lawsuit against the city. Attorney General Loretta Lynch stated that the lawsuit alleges a pattern and practice of unconstitutional police conduct. This entry was posted in Civil Rights, Corruption, Demonstrations & Protests, Economics, Government, Human Rights, Income Inequality, National Security vs Police State, Racism, Social Justice and tagged Atrocities, Civil Rights, Corruption, Department of Justice, Economics, Equality, Ferguson, Human rights, Income Inequality, Michael Brown, Police Brutality, Police State, Protests, racial bias, racial profiling, Racism, social justice on February 12, 2016 by ew. Written by Terrance Heath. Published on December 26, 2015 by Campaign for America’s Future Blog, republished by Common Dreams on 12-27-15. 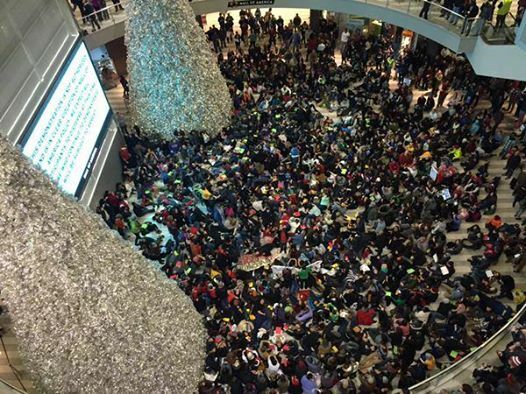 Over 3000 protesters gathered in the Mall of America on December 20, 2014 in support of the BlackLivesMatter movement. Image via Facebook. Michael Brown. Eric Garner. Laquan McDonald. Sandra Bland. Walter Scott. Rekia Boyd. Tamir Rice. Most Americans have at least heard their names, and the stories of how they died. We have seen videos and images of their deaths, or of the aftermaths. 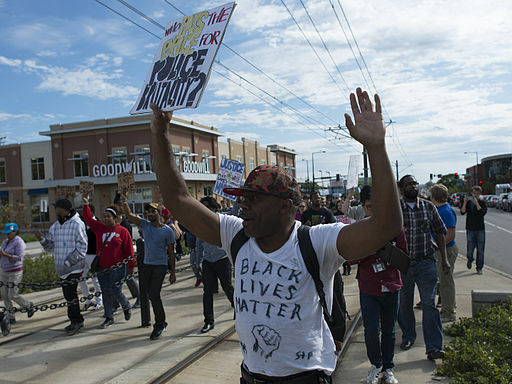 They are African-Americans who have been killed by police, or died in police custody, in just over a year. There are many more. We know their names because of the ⌗BlackLivesMatter movement, born after George Zimmerman was acquitted for the murder of Trayvon Martin. The ubiquity of smartphones and mobile internet access put the tools of the media in the hands of savvy, young, blacks who used them to demand America pay attention to what had long been going on — and going unheralded — in black communities, where the police acted as an occupying force, and court systems turn jails into debtors’ prisons with endless, exorbitant fees and fines. This entry was posted in Civil Rights, Corruption, Demonstrations & Protests, Economics, Government, Human Rights, Income Inequality, National Security vs Police State, Racism, Social Justice, Solidarity and tagged Atrocities, BlackLivesMatter, Civil Rights, Economics, Equality, Eric Garner, Human rights, Income Inequality, Laquan McDonald, Michael Brown, Police Brutality, Protests, racial bias, racial profiling, Racism, Rekia Boyd, Sandra Bland, Security, social justice, Social Media, Solidarity, Tamir Rice, Trayvon Martin, Walter Scott on December 28, 2015 by MNgranny. When five protesters were shot by white supremacists in Minneapolis, Minnesota on November 22, my world turned a bit upside down. My time as an activist there, from 2006-13, has largely informed how I organize and do movement building. I knew at a lot of the people involved and was quickly on the phone. 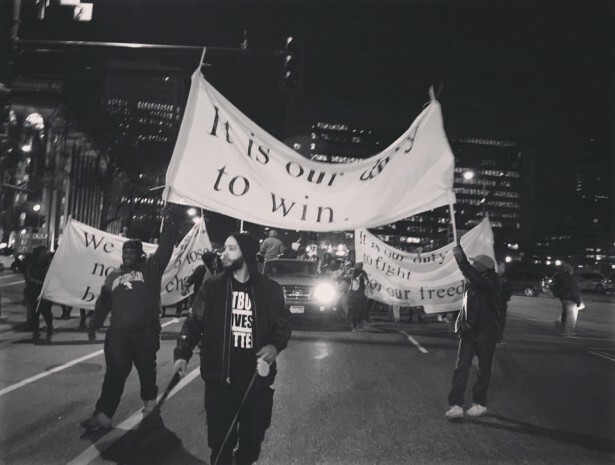 The protesters’ campaign demanded justice for Jamar Clark, an unarmed African American who was killed by Minneapolis police a week before. This entry was posted in Civil Rights, Demonstrations & Protests, Government, Human Rights, National Security vs Police State, Peaceful resistance, Racism, Social Justice, Solidarity and tagged BlackLivesMatter, Civil Rights, Human rights, Minneapolis, Protests, race, racial bias, racial profiling, Racism, social justice, Solidarity on December 21, 2015 by ew.